I was in a mood not too long ago to see some black and white SF B movies. With various reference books and documentaries that examined these movies, I came up with a list of ones I wanted to see (and either hadn’t ever or hadn’t since childhood's rainy Saturday afternoons of creature feature). The first movie I cared about finding was a post-apocalyptic thriller, Panic in the Year Zero, starring and directed by Ray Milland. The nuclear war comes (at 1962 levels, so it’s a survivable one). An L.A. family is on a camping trip when the war happens literally in their rearview mirror. The dad, Milland, quickly understands how society will collapse, and his job is to keep the four in the family alive through that phase and until society begins to rebuild itself. He behaves aggressively to accomplish this goal. The movie is good, despite being 55 years old. It’s the a brutal sort of post-apocalyptic story that hadn’t been, so far as I know, depicted in movies before that. There were movies about mutant monsters and sole survivors, but nothing really like this. The Road, or The Walking Dead, or my own series Gray or most books you read in this genre are in the tradition of this movie. This has a bleak view of humanity. It talks directly of matters of right and wrong and expedience. When we do evil to accomplish an end, can we still call ourselves good people after we’ve done it? It’s a debate Milland’s character and his wife, played by Jean Hagen, have. 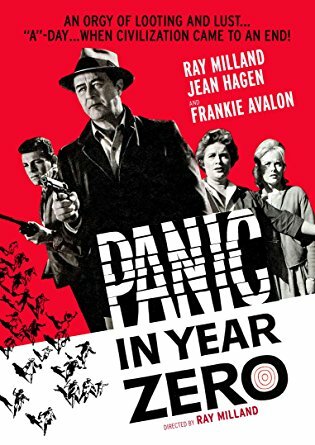 I spent a bit more money on this one title to get this version, which has a decent film commentary that talks about the film’s place in history and the various ways in which many of the supporting actors died within years of its release of alcohol-related illness. He also talks about the ahead-of-his-times prepper strategies the Milland character uses. Frankie Avalon plays the son and does a great job--many of the reviews you’ll find online say “I didn’t know he could act,” but in fact here he proves he can, including when he has no dialog. A strange aside: it at first seemed bizarre to me that everyone fleeing L.A. is white in the film, and I thought it was just because the film was made in 1962 and therefore unconsciously prejudiced, but then I looked up census figures to see and LA in fact was 94% white in 1960. (I was shocked.) So it was simply accurate. I learn something new literally every day because of the internet. I know a number of my fans love all things post-apocalyptic, and if you haven’t seen this movie yet, hunt for it. Maybe your local library even has it! If not, the DVD I linked is well worth it. Found it on Amazon Prime for a 3 dollar rental. Watching now. Thanks. fantastic! let me know what you thought of it.